From April 15-19 at Intertops Poker and Juicy Stakes Casino, get up to 100 free spins on some of the casinos most popular slots from Betsoft when you deposit. The more you deposit, the more free spins you receive. A $100 deposit can get you up to 100 free spins, but the casinos are even giving you free spins with deposits starting at just $25. 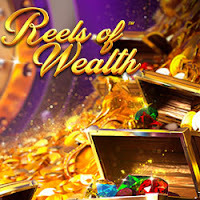 Free spins weeks are a great time to try some of the casino's most popular slot games from Betsoft: Sugar Pop 2, The Angler, Fruit Zen and Reels of Wealth. "Free spins bonuses give players some extra play time," said Intertops Poker's casino manager, "And they nudge players to try some of the new games that other players have been enjoying." Reels of Wealth is a player favorite at both Intertops Poker and Juicy Stakes. Its popularity may be due to how often its Megastar Jackpot mini game pays out, or maybe it's just that players are inspired to win by all the game's glittering gold and jewels. Fruit Zen is set in a serene cherry orchard but with features like an expanding Wild it's anything but calm. Intertops Poker and Juicy Stakes Casino welcome players from around the world. In addition to the busy poker rooms they're so well known for, they also offer a wide selection of slots and table games like Blackjack and Roulette. Free spins will be credited within 24 - 48 hours of the deposit. Wagering requirement: 30X. Max cash-out: $250.